I have just been outside with my son Zak with his go cart and as usual took the opportunity to do a bit of bus spotting - if you could call it that when there is one bus every 15 minutes! 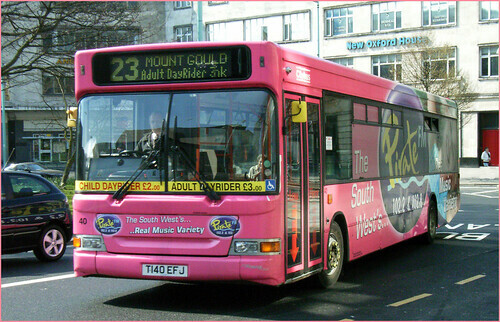 On the 50 was Citybus Dart 40 T140EFJ which now sports a very bright multicoloured advert wrap for Plymouth Sound Radio. Until recently this was the advert for Pirate FM! Sadly I wasn't quick enough to get a photo. I know I will soon though!